The Golden Spoons: Ooooh - Sparkles!!! Due to the crazy busyness of the end of school, I haven't posted anything on here in a while. But, after this happened, I just had to "write" it down somewhere so it would be preserved for me to share with my girls later in life when they have their own children. It's one of those classic "this must be payback" moments! So here's a little anecdote for you . . . . Yesterday, Rachel had stayed home from school because she was recovering from a strep throat like virus she had over the weekend. Megan had her end of year party, after which I just brought her home. So here we were with nothing much to do for the afternoon and it was seriously hot outside. So, logically, we spent the afternoon in the pool. For two and a half hours, we splashed, laughed, and just had a great time. When we got out, it was already 5:00, so I decided to go ahead and have the girls get their baths/showers. Then they could relax while I cooked supper. Anyway, after supper I took them into the playroom. Emily was given a wet cloth to wipe up the table and Megan was given a vacuum cleaner to clean up the floor. Then, back to the shower they went. 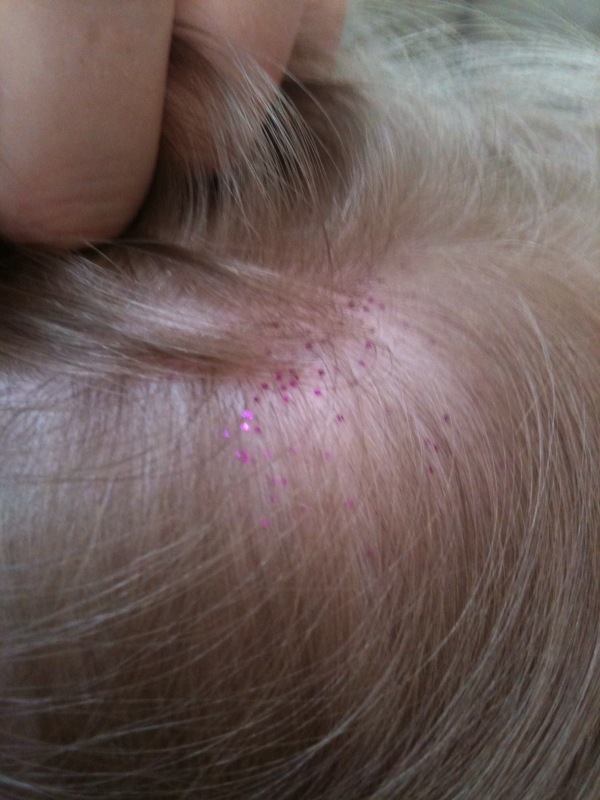 I personally scrubbed their scalps, but alas, the glitter remains. Heaven only knows how many shampoos it will take for the glitter to disappear completely. In the meantime, at least i can say I have saved this anecdote for posterity (and to hold over their heads when they are mommies!). And, if the sun shines in just the right angle on their heads today and you notice a glare - well, now you know why! Sometimes we just have to laugh. . . . . Unfortunately, I was too busy trying to control my temper to take a "before" picture. This is an "after " picture of Emily I took this morning. As you can see, her glitter was purple. Megan's was silver.